The client is a non-profit membership association that represents the interests of about 200,000 nurses by providing nursing education, standards, and clinical practice resources. Their registered nurse members manage, teach and practice perioperative nursing, are enrolled in nursing education, or are engaged in perioperative research. The client defines and advances best nursing practices for surgical patients by researching and distributing scientifically based guidelines. To keep up with the latest preoperative practices, nurses need to maintain their license and certification requirement. In order to assist the nurses with this, the client needed to create multiple eLearning modules for CME (Continuing Medical Education) program. The modules were to be developed on topics ranging from Surgical Environment, Wound Closure and Healing, Surgical Draping, Endoscopic Surgery to Professionalism, Preparing the Preceptor etc. Harbinger participated in a formal RFP process. During the bid evaluation, the client concluded that Harbinger had what it took to handle their requirement. Harbinger had the experience of working on medical content and the capability to make it instructionally sound and visually appealing. Harbinger’s team of instructional designers studied the content thoroughly, and worked closely with the client’s SMEs on defining the best approach to present the content in an engaging and interactive manner. Since the learners were from medical background but not doctors as such, the team had to balance the delicate act of presenting serious content in a fun way but at the same time not lose the impact and effectiveness of the complex concepts that were being taught. This was managed well by chunking the content into small, bite sized learning nuggets put together as standalone modules. 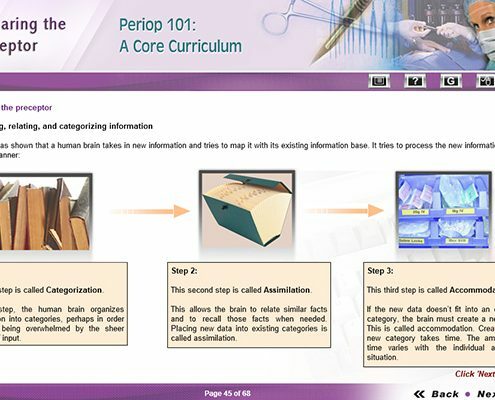 Since the time was of essence, and Harbinger had to produce a large number of modules in a short time frame, a tool relatively new at that time, Lectora was used to author these courses. 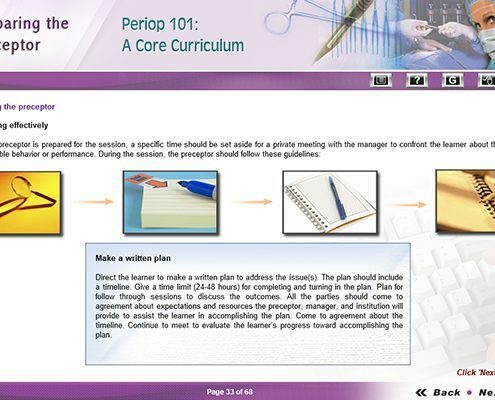 The instructional designers created visual storyboards in the tool itself, saving time and effort for the team. This approach worked wonders as the final product was a visually rich and impactful CME program. The course has been successfully used to train hundreds of nurses till date. It has helped them to gain new skills and update existing ones, required for the licensing purposes. This program has resulted into huge cost savings for the business and their end clients, as the nurses have been able to treat it as a self-paced learning program and hence there was no spend on logistics and the infrastructure of the classroom training environment. The learner impact of the courses has been considerably positive, as their interactive nature helped in better and quicker understanding, as well as a better recall of the content.